Whimsical Wednesday - Exciting News and this weeks Challenge. First up this weeks challenge is to use the sketch below to inspire your project. I have used a saturated Canary digital stamp - I love this girl with dreads. Coulored with copic pens and a few metalic pens. I have added a few pearls to the edge of the mount and a little lace. The sentiment stamp is one of Stephanie's and is just half of the stamp- the other half was masked. 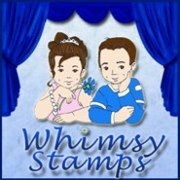 This week our sponsor is Whimsy stamps - they do have the most adorable stamps! And they are giving away 5 images to our winner. WOW! 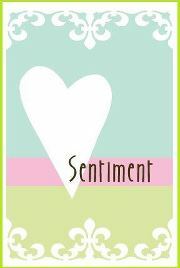 Please pop over to the main blog to see the gorgeous inspiration from the rest of the DT. Now for the exciting news..... We are having a DT call. The call will run from today 24th April to 8th May . Love your card, Sue. Love those butterflies. Your coloring is Amazing. Awesome job. 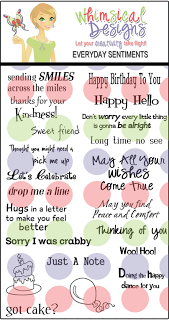 Sue, I just love this card and I absolutely love your coloring! Perfect colouring in of this lovely image. The finished result is super.